The wartime experiences of Channel Islanders have been a popular topic in fiction recently, most notably with the quirky Guernsey Literary and Potato Peel Pie Society by Mary Ann Shaffer and Mary Horlock’s much darker The Book of Lies. 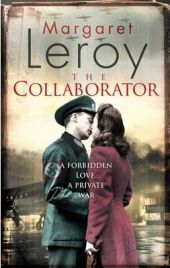 There are a few that don’t make the grade however, among them Margaret Leroy’s The Collaborator. The premise is hardly original but there are plenty of opportunities for the story to be developed; these chances are not taken and the novel suffers because of that. Vivienne de la Mare lives on Guernsey with her daughters – Blanche is fourteen and has just left school, Millie is much younger, still at the age for bedtime stories – and her aged and increasingly infirm mother-in-law, Evelyn; her husband, Eugene, is away fighting in the war. A sudden change of mind sees Vivienne miss the last opportunity to get herself and the girls off the island and days later the Germans take the Channel Islands. The house next door, empty since the family who own it fled to England, is, like so many other vacant properties on the island, becomes home to a number of German officers. In spite of the stories, Vivienne finds she can’t blindly hate these men and she watches the comings and goings with curiosity; she can’t forget that these men have wives and families back in Germany. As the occupation goes on life becomes more and more difficult; food is scarce and Vivienne has to watch Evelyn become more frail and confused. When one of the Germans offers food and a shoulder to cry on, Vivienne is too vulnerable to refuse. Before long the two have embarked on a passionate love affair with Gunther coming to the house each evening after dark. But this is wartime and soon Vivienne starts hearing stories about other women on the islands who have been spending time with German soldiers; before long Vivienne learns that people are talking about her too. There are plenty of good things about this novel. The relationships between the de le Mare women, particularly those between Vivienne and Evelyn, and Vivienne and Blanche are finely drawn. As the war goes on Evelyn has increasingly fewer lucid days but there’s a great deal of uncertainty – especially on Vivienne’s part – as to how much of what’s going on Evelyn understands. Should Vivienne believe that Evelyn does not suspect what her daughter-in-law is getting up to in Eugene’s home, and what would Evelyn do if she knew? Blanche is a fascinating character; one can’t help feeling sorry for this young woman whose wings are clipped by the war. At first she is furious that her mother hasn’t taken the opportunity to go to London; she’s been there before as a child and in her mind it’s an exciting and glamorous place. Before long, though, Blanche is asking her mother if she might be allowed to go to a party being thrown by some young German officers; as far as she’s concerned it isn’t her war, this is a war created by adults and, besides, where is the harm in dancing? Only a little way on Blanche’s attitude has changed but, disappointingly, there’s no explanation for her change of heart. As for Vivienne, I found her a somewhat confusing character; capable of self-discovery on the one hand but horribly naive at the same time and the two were at odds. It’s also disappointing that Leroy does not explore some of the aspects of the occupation in more depth because the love affair between Vivienne and Gunther is not sufficiently exciting or interesting to recommend The Collaborator. Johnny, the son of a family friend, confides in Vivienne that he is involved in some kind of resistance activities and although this is referred to several times, no detail is given. The subject of the slave workers, prisoners brought to the islands to build up the fortifications is introduced at a relatively late stage so that when this crops up the outcome is rushed and any chances of injecting some drama are squandered. While I appreciate that Le Colombier’s isolated location does shield the family from some of the more harsh aspects of the occupation, the war hardly seems to touch the women there. Leroy might capture the details of wartime existence (if I ever need to bake a cake with minimal rations I now have plenty of ideas) but she doesn’t capture any sense of fear or passion, a major failing in my opinion. Vivienne falls too easily into the love affair and this just doesn’t ring true: it feels like a relationship of convenience and I couldn’t imagine why she would put herself in this situation unless she was head over heels in love. There are several questions of credibility, not least the idea that this man could turn up at the house undetected every night when there are three other people in the house. I wanted to like this novel but I found it difficult. Leroy tells a good story even if that story is flawed. Don’t read The Collaborator expecting to learn about the occupation of the Islands in the war; on the other hand don’t expect a tearful romance. This novel lies somewhere between the two. It isn’t awful but it could be so much better. No Comments on "The Collaborator"